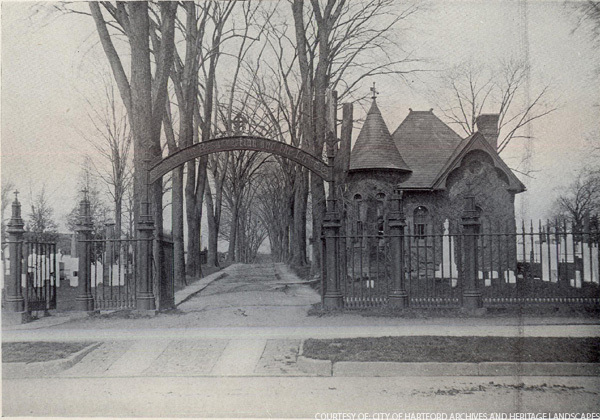 Located about 1-1/2 miles north of Hartford's core, Old North Cemetery was established in 1807 as a municipal burying ground in response to the overcrowding of the Ancient Burying Ground, which had been used since 1640. Many of Hartford's leading 19th-century citizens — Wadsworth, Watkinson, Ellsworth, Horace Bushnell, and Frederick Law Olmsted — are laid to rest within this modest landscape of approximately 17 acres. While no longer actively accepting interments, the grounds serve as an important and culturally significant green space within the city, state and nation. Old North Cemetery was created at a time when functionality dictated the character of burial grounds; the landscape is of a simple aesthetic, rows of gravesites defined within a linear network of carriage drives and paths. The tree-covered grounds include an iron fence along the Main Street, brick office building, and largely unadorned grave markers throughout. It isn't until the mid-19th century that the character of cemeteries shifted from these small burial yards to expansive, scenic landscapes meant as places of tranquility and reflection. The ability to maintain the grounds dwindles over time and the condition of the landscape declines. Public awareness of the poor condition of this culturally significant burial ground began in 1980 with inclusion of the grounds on the Connecticut Freedom Trail, and continued through the publication of articles, listing on the National Register of Historic Places, and support of Clay Hill/Arsenal communities. CTASLA also hosted its Olmsted Award ceremonies in the cemetery on occasion. By 2008 the Court of Common Council adopted a resolution for the care of public cemeteries in recognition of their historical significance to Hartford's residents. A grant from the Arthur Vining Davis Foundation supported documentation of persons buried there, and in 2009 the Connecticut Commission on Culture and Tourism funded the Historic Landscape Preservation Plan to document the cemetery’s history and develop a rehabilitation plan. Phase 1 treatment, prioritizing public safety with removal of hazardous trees, reconstruction of crumbling pavements, and repair of 19th-century features, began in 2010 with $1.2 million dollars funded by the City of Hartford. The Old North Cemetery landscape is important in its association with events that have contributed to broad patterns of United States history and is a testament to the shifting perception of death and burial practices from functionally toward the picturesque. The significant lives of figures notable in local and national history such as Olmsted, Bushnell and Connecticut's 29th Volunteer Civil War Regiment secure Old North Cemetery as valued place for future generations.